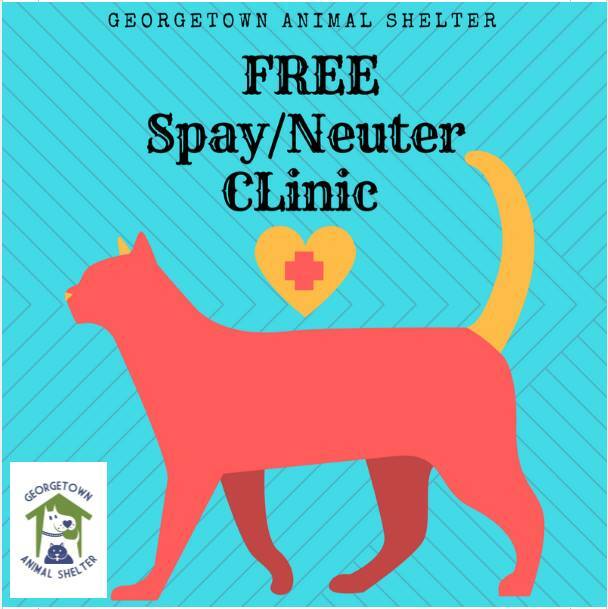 Did you know that the city of Georgetown Animal Shelter offers 3 FREE spay/neuter clinics every year for city residents and their pet cats? Ah. May. Zing! Here is what you need in order to participate: 1. You must be a city resident and provide proof (i.e. driver’s license, utility bill etc.) 2. You must schedule an appointment 3. Hard plastic cat carrier (no wire dog crates please!) 4. Cat/Kitten must be 3 month old or older 5. Cash or check ONLY Here is everything included in your FREE service: 1. Spay/neuter 2. Rabies vaccine 3. City license 4. Nail trim 5. Injectable pain medication and antibiotics (done by vet at shelter) Here are additional services you can purchase at a low-cost: 1. FVRCP combo vaccine: $5 2. Feline Aids and Leukemia test: $20 3. Microchip: $10 4. E-Collar: $10 (*EXTREMELY* recommended for female cats) Interested? Who wouldn’t be! AND you will be helping the shelter with the overpopulation of cats and kittens. #winwin Call 512-930-3592 or email animalsvc@georgetown.org to schedule your appointment today!